The Digitech Studio Quad FX processor was released in 1996, and then 18 months later Digitech released the Studio Quad v2. The v2 machine was exactly the same unit in terms of hardware, but it had been given a major software update with 80 new preset patches to add to the 100 present on the original machine, plus 10 new effects modules. These include Smooth Pitch Shifter, Harmony Generator, Rotary Speaker, Analogue Delay simulations, Chorus/Delay, Flange/Delay, Pre-Delay, Room Echo and Compressor. For full details of the Studio Quad v2 updates you can take a look at the Sound On Sound review from 1997 HERE. This EPROM can be fitted to your Studio Quad v1 in a matter of minutes to upgrade it to a full v2 unit. All you have to do is carefully lever out the old EPROM with a screwdriver or similar, and put the new one in its place, taking care to orient the notch in the end of the chip the same way round as the original. Basic anti-static precautions should be taken, as if you were installing RAM into a computer. Obviously the unit should be unplugged from the power while you do this. You will probably have to do a factory reset next time you start it up, so you will lose all your old effects settings unless you save them over midi sysex beforehand. A factory reset is done by holding down the '1' button while you power up the unit. After it boots and the 'D' of the Digitech on the screen turns into a asterisk, you should press the program button. Heres a YouTube video detailing the installation of this chip by someone in the US. We'd recommend discharging static by touching something like a radiator, plumbing or the metal case of a bit of kit that has a definite ground connection, like a PC or mixing desk. 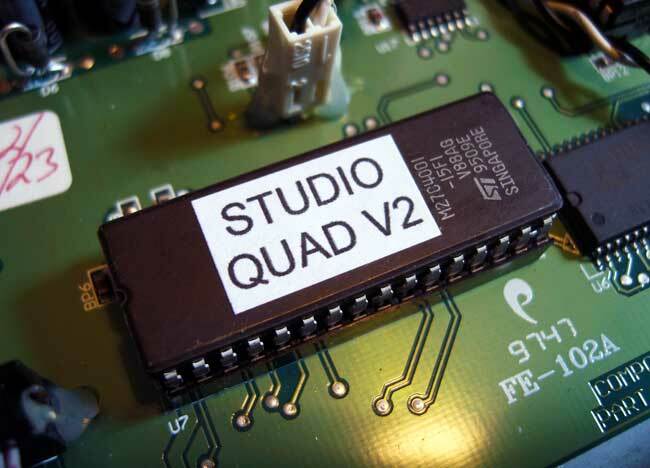 IMPORTANT: This EPROM is for upgrading a Studio Quad version1 to a version 2, and NOT for a Studio Quad 4 or Studio 400, which are completely different machines. If you want to buy one of these EPROM's click on the Buy Now button below. Payments are processed via Paypal, but you can pay using a credit or debit card without having a Paypal account. If you want to pay using some other method, please get in touch via the CONTACT page. PLEASE NOTE: We can no longer ship EPROM's to Italy. You can blame the thieves in your postal system who seem to have an uncontrollable urge to steal OS EPROM's for old music kit.